Base erosion and profit shifting (BEPS) refers to tax planning strategies implemented by multinational companies that exploit mismatches in tax laws to shift profits to low or no-tax jurisdictions where there is little or no economic activity. The OECD Action Plan on BEPS, introduced in 2013, set 15 specific Action Points to ensure international tax rules are fit for an increasingly globalized, digitized business world, and to prevent multinational companies from paying little or no tax. In October 2015, the G20 endorsed the BEPS package. There are four BEPS minimum standards that all Inclusive Framework member countries have agreed to implement: Action 5 – harmful tax practices; Action 6 – treaty abuse; Action 13 – transfer pricing documentation; and Action 14 – dispute resolution. The Thai government agreed to join the Inclusive Framework in 2017. One part of the Action 5 minimum standard relates to preferential tax regimes where a peer review is undertaken to identify features of such regimes that can facilitate BEPS, and therefore, have the potential to unfairly impact the tax base of other jurisdictions. A country with a preferential tax regime could potentially be listed on the EU’s tax haven blacklist, which is expected to be adopted by 5 December 2017.
International trade center – in the process of being eliminated/amended. The OECD and EU seem to be actively pursuing these commitments under the threat of putting Thailand on the EU’s final blacklist of December 2017. If this occurs, the EU will consider tax and non-tax defensive measures, and non-EU countries may also pursue measures against blacklisted nations. 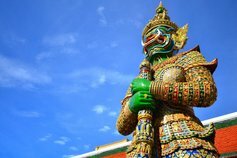 No announcement has been made by the Thai authorities about the contents or timing of the amendments to the tax regimes found to be preferential tax regimes by the OECD. Thai taxpayers operating under any of these regimes should continue to carry on with business as usual until changes to the regimes are enacted, but to be aware that changes may come. © 2019 KPMG Phoomchai Tax Ltd., a Thailand limited liability company and a member firm of the KPMG network of independent member firms affiliated with KPMG International Cooperative (“KPMG International”), a Swiss entity. All rights reserved.